Some of the many samples littering the office. They say absence makes the heart go fonder. The beloved husband took a short trip out west to see his kids. We rarely travel separately so it was different at home. Aside from eating my favorite dishes that he doesn’t like (ok, there may have been an ice cream supper), there were extra chores for me. We each have our “things” that we do. A routine of sorts. Some of it is personal stuff like playing guitar or exercising or daily runs to Starbucks. Some is house chores. The first thing I noticed in his absence was that the bed didn’t get made. That damn thing didn’t make itself! That’s easy to fix although the cats preferred the rumpled mess. The garbage needed to go out so I did that. I missed him but it wasn’t for those things. We don’t hang together during the day unless we are working on a project together. Most of the time I have no idea where he is. I threaten to get a GPS implanted in him so I can track him! I appreciate knowing he’s around even if I don’t see him. Sometimes we’ll throw caution to the wind and have a romantic pizza lunch. He likes to do some things that I don’t, like pulling weeds and mowing lawn. I like doing other things that he doesn’t, like gardening, growing tomatoes and flowers, keeping the flower pots blooming and cleaning cat litter. Ok, no one likes doing that. It evens out but it was nice to have a reminder on all that he does. Then we started the carpet project. We are replacing the wall-to-wall carpet in our office. Not a big deal. We pick it. Someone else installs. We love what we have except it’s worn. Badly worn. It isn’t available anymore. Nor is there anything like it. This is new territory. Making a decision became more complicated. Every morning between 9 and 10 a.m. we went out looking. After several trips and tons of samples we settled on something although there was no gusto in the decision. (This should be fun and exciting!) As we went to place the order I noticed that I didn’t like it when it was laying on the store counter. We started the process to place an order. They want to come to the home to measure because we may not be capable of measuring a square room accurately. That gave me a few days to change my mind. They don’t collect money or order the material until they measure. I was sure he would get agitated that I was changing my mind yet again but he wasn’t. The next morning between 9 and 10 a.m. we went back to the carpet store for more samples. I stayed with my original decision but I have a lot more confidence about it now. What I learned the past few weeks is that he is patient and laid back. Both of us have become less intense over the years. Nothing is the end of the world. The worst decision can be reversed. It just costs money. I wish I would have been like this when I was young. Maybe you have to ease into it to be satisfied with where you are. There is no greener pasture. I know. This entry was posted in Aging Gracefully, Humor, Life at Home and tagged appreciating your spouse, carpets, chores, colors, decisions, home renovation projects by Kate Crimmins. Bookmark the permalink. Kudos to you for biting the bullet and making the decision, even if it did involve a million and one samples. You’re still light years ahead of me!! Only creative people have ice cream for dinner! One way to get a project moving is to remember that we would have to do it for resale. We keep saying we will downsize in the next year or 3 and that has driven some projects. Better to change it out now so I can enjoy than to do a week before it’s goes on the market. In a way though it makes the decision harder. A year ago we had to change out the carpet runner on the stairs. The first step was threadbare. I loved it. It was a colorful oriental. I bought a neutral (for resale) and now I’m sorry. I miss the colors on the stairs which is a mostly colorless place. I too have a mindset that we should be moving in the next 2 years max, so I’m driven to address some of the things that need work now so we can enjoy them first. I have some of those different page issues too. Funny how you settle in specific roles and how things sometimes seem out of balance when the other isn’t there. It’s been a while since either of us traveled alone so it was noticeably different. I enjoyed the quiet and of course the insane eating patterns but I was glad to see him come home. My God, I can’t imagine all those carpet samples you had in your home! That would have driven me crazy with too many choices. But good that you’ve made a decision. When bought our place last year the sellers touted the brand new carpet. Now that we’re in it, we see they really got it on the cheap. So probably in a year or two we’ll have to get something we really like. I may have to refer back to this post of yours. 🙂 – Marty. When we built the house 15 years ago, it took me a half hour to pick out carpet and 4 months to pick out siding color. I was happier with the carpet than the siding. BIG decision when it comes to carpeting. Luckily we have tile in the whole place. New tile in the three bedrooms (or two bedrooms and an office which is how we have chosen to use this little Casa) in a herringbone pattern that the previous owner selected and I really like it. It’s cool and I mean cool to the feets. It gets HOT here. And “things” to do… I didn’t realize how much CH did until he spent 12 days face down in a special chair for rehab after surgery for a macular hole. Sure opened my eyes to how much we both share chores. And he is the cook! But surprise! I can still cook, of course, and enjoyed it. You took your time with the carpeting and I know it will be perfect! I love berber. About mellowing out, I think I have done some mellowing but I could mellow out a whole lot more. I can’t wait for a picture of the carpet in the office???? Carpet will take 3 weeks or so. Having someone face down for 12 days would be an eye opener in many ways. Hope all is well with his eyes now. We have mostly hard surfaces here — hardwood, tile and a little linoleum! As carpet got worn we replaced it with a hard surface because it’s so much easier with cats. However, the office looks better with a carpet. There is a lot of wood in there so I didn’t want hardwood. It gets cold so I didn’t want tile. The last carpet lasted 14 years so I’m hopeful! I love the ice cream supper! We just had the entire inside of our house repainted and I held my breath as each room was completed. I will have to say I breathed a sigh of relief when the project was complete and the colors we selected flowed so beautifully! Prior to this we made a costly color mistake that we chose to live with for the past few years in our bedroom and the guest rooms.It is so nice to see them in a color we now love! I wish the same for you! I’ve done that too. I painted our music room the wrong shade of tan-off white. I repainted it the next day. I have a painting “routine.” First I put some on the wall. Then I start jumping around because “it’s the wrong color.” That’s because wet paint is different from dry paint. Then there is the bright blue painter’s tape that clashes so it makes the color look wrong. It’s a very stressful day until the tape is off and the color dries. If I’m lucky, it’s exactly what I chose. BTW – Ice cream is a perfectly acceptable dinner. It’s on the food guide. ‘Dairy’! (and if you get the mango, strawberry, raspberry…..kind, you can also check off ‘Fruit’! An ice-cream supper made me smile. Wait ’til the cats get wind of the carpet project … first the floor ordeal, now this … unless they don’t get to hang out in the office? The wall-to-wall carpeting in this house was installed in 1985 and still in good shape, but it was just the two of us, and the last 9 years just me, and no pets … canaries don’t beat a path down the hall luckily. In this small house, there’s only one way to get to the other rooms, so to keep from replacing it for a long time, I may need to learn how to be like Peter Pan. We have one remaining “original” carpet from 14 years ago. Guest bedroom, rarely used. Still looks good. If I changed it, I’d stay with the same color so it makes no sense to change. I agree – the carpet here looks good. My mom wanted to tile the bathroom with the tiny tiles many years ago, but she was using a cane at that time and was afraid she’d slip on the shiny surface, so we never did. It is such an ordeal with new carpet – picking up fuzzballs from new shedding carpet for months as I recall. As bad as buying new sweat suits … you walk around the house and fuzz is everywhere! I forgot about the fuzz but you are right! Most floor tiles today are non-slip. My bathtub is slippier than my tile floors. We have to keep a mat in there so no one falls. That’s good to know if I ever have to get it tiled. Most of the time through the years has been spent in the kitchen, the only room without carpeting. I don’t blame you for hesitating – that is a big decision! Yes, time apart is weird when it doesn’t happen that much. But can be kind of nice in some ways! It is nice. I like alone time. I spent most of my life living alone so I’m used to it. I get to miss him. I eat bad stuff. All good! I’m a big supporter of time apart. My husband used to travel a lot for business and I found it gave me time to watch movies he hated, listen to tunes really loud, and a dozen other things. Plus I missed him, which is good to remember. Yes! I go vegetarian when he’s gone. My routine changes (except for Starbucks) and I do miss him. I came back from almost 2 weeks away and wonder of wonders, the cat box had been cleaned! The house had been vacuumed! Okay so there was a massive spider web over our bed but you can’t have everything. Lol I often keep looking just to ensure that I am happy with what I picked! I can’t do that or I’d drive myself crazy. I wouldn’t remember what my choice looked like exactly and I’d be second guessing. They think 3 weeks. Hopefully. Ice cream dinners sound good to me! That happened when my husband was gone too. The kids loved it. LOL! I don’t think I ate meat the whole time he was gone. All comfort foods. Best mac and cheese ever! I love my husband but a few days being alone in our house while he is traveling sounds like heaven! I’m not even sure what I would do; probably not much different than I do anyway… but just being by myself and doing whatever I want, whenever I want (popcorn for dinner! staying up until midnight reading!) would be fabulous. Of course, after about three days, I’d start to miss him and want him home again. Aside from taking out the garbage that’s how it was here. I like being by myself although I get a lot of alone time when he’s here. He’s either in the yard, basement or music room! The difference is that I can eat (or not) anytime, anything. That’s always nice. I read a lot of books. Perhaps many visits to carpet places isn’t high on my list of fun but it did the trick! It is rhythms. We never get in each other’s way or sick of each other. Too many varied interests going on. Works for us. Time brings maturity, which brings mellowing in everyone, I think. We are still passionate, but probably about different things than what inspired us when we were young. Nice to see the plus side of mellowing! I’d want to take a lot of time deciding on something that you will live with for a long time. Had to laugh, picturing dogs smelling the samples that your cats enjoyed. Ice cream suppers — we have them frequently. We eat our heavy meal in the middle of the day, never with dessert. Much later at night, we won’t be hungry for healthy food and opt for a small dish of ice cream. It works for us!!!! That’s why we are so well-rounded. 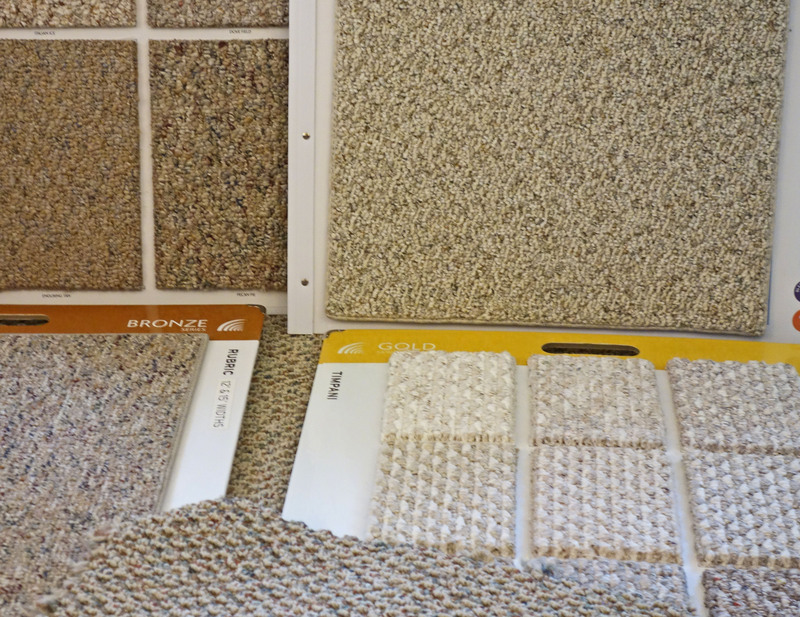 Your carpet samples “match” our carpet! Very durable. And cat friendly. I have had a few occasions where I immediately repainted a room because it didn’t turn out as expected. Fortunately it’s not all that costly. Earlier this week, I was home alone too, Kate. Since Derek is the cook, I dined on Skinny Pop Popcorn…my favorite meal. 🙂 Those are some nice looking carpet samples…look like berber. Love the popcorn supper! They are berbers. The existing one is a tweed with several colors in it. Today’s choices are much more neutral (and bland). I am getting one with some color variation. Still like the old one better but it’s time for change. I love that you don’t let this kind of stuff bother you anymore. I know what you mean . . . some things just take time to learn. I wonder how different things would’ve been if we knew the things now when we were younger. When we moved in this house 2 years ago, we had to replace all the flooring. We bought bathroom tile at one store, wood (laminate) at another store, and carpet for bedrooms at yet another. I understand the extra chores when the hubs is gone. They really do more than we realize until they’re not around, even though it may require some nagging (at least with mine). My husband is a meat-potatoes-gravy type of guy so an ice cream dinner is really a treat! If I had to change something about him (which I really don’t want to) I’d want him to eat more veggies (like sweet potatoes and cabbage) and have ice cream for dinner once in a while. Being left behind on travel is OK sometimes. (I used to paint rooms quickly – as a surprise. Husband always is so detailed/process oriented that he’d take forever just prepping then the painting was so full of expressive complaining as he hates to paint – not to mention the it was never an express cleanup.. He finally admitted he was secretly relieved to come home and find it was done. “Both of us have become less intense over the years.” Same in our household, too. I guess aging has the advantage of giving us perspective so we don’t need to freak out over something that will pass or will maybe leave a scar, but we know life goes on and there are still love and kitties ahead. Rooms can be repainted and carpets replace. There are few decisions that are life shattering, at least for us. and the cats that can’t clean up their own poop!